Who is Steve Zipp? Which is hardly the mystery at the heart of his novel Yellowknife, but still the question is worth posing. How intriguing, this pseudonymical person whose book is as enigmatic as its author. The Yellowknife of the tale is the capital city of the North-West Territories whose law and order is maintained by the North-West Mounted Police-- details revealing the reality we're dealing with here is not straightforward. Though they do have license plates shaped like polar bears in Yellowknife, but that's not the sort of thing quite plausible enough for fiction, is it? Very little is straightforward in either Yellowknife-the-city, or Yellowknife-the-book. "Borders exist for a reason," the novel warns us, and one reason is that when upon crossing this one, all bets are off. Dogs hijack snowmobiles, characters disappear beneath the ice, a Perfesser philosophizes at the dump, and tunnels down in the earth keep turning up in the strangest places. The legendarily mystical North a perfect setting for this kind of magic (which the book turns up and satirizes), juxtaposed in a perfectly readable balance with a (literal) grittiness one would expect from a place where the elements and mining factor so centrally. The story takes place in 1998, a bureaucratic nightmare of a time as the territorial government is currently in the midst of splitting into two. Though not overly long, Yellowknife has something of a sprawl about it and sprawling indeed is the Cast of Characters, not one of them incidental. The novel's shape is not particularly taut and some parts reach out into tangents left unresolved, but I still found my reading most satisfactory. The many characters actually populating this strange place, from the drifter whose car is destroyed by a buffalo, the gravid biologist employed by the government and specialized in voles, her fiance who presents her with a ring whose stone is coal. The shady dealer with an understandable fear of dogs and his numerous failed business ventures, one of many rushing for gold but coming up way short. 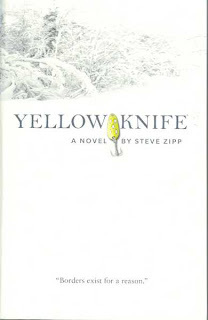 Yellowknife is one of those novels fat with allusion, giving readers the impression that nothing means nothing, even if it's not altogether clear what means what. At its most accessible, the novel is a hilarious satire, silly and absurd, but signs are scattered throughout the text indicating something deep down and more profound-- sort of like the universe itself.